Let me begin by stating that if you click the "terrain" tab on Google Maps, real topography of the Fox River Grove Crit course is shown in relief. This hill is no joke. I hadn't participated in this race in two years and my reintroduction to the climb was a slap in the face. My legs did not want to ascend in the very least. The initial ascent strung out the field in a hurry and I was caught somewhere in the middle. I fiercely chased the lead pack, taking the corners at combat speed the whole race and managed not to get pulled. 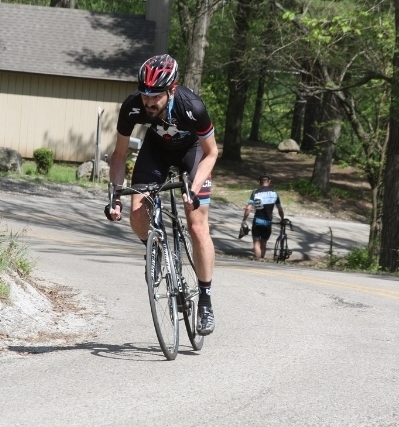 The final lap I had some matches to burn so I attacked the climb and passed a few and held off some more. On the descent, the lead really pulled away and I saw one straggler in the omnium leader's jersey as I passed him and he grabbed my wheel. I attacked a few times but couldn't drop him, so we had a spirited sprint to the line of which he bested me by a bike length for 11th. Pedal over pedal. T. Riley at Fox River Grove, May 17th, 2014. Photo/Amy Dykema.